This item may require a license or other authorization from the U.S. Government to be exported from the United States*. Without limitation, anyone purchasing this item is solely responsible for determining applicable export licensing requirements and for obtaining any licenses or other authorizations from the appropriate agencies of the U.S. Government necessary for exporting it, such as the U.S. Department of Commerce or the U.S. Department of State. *Subject to control by the U.S. Commerce Control List (set forth in the Export Administration Regulations) or the U.S. Munitions List (set forth in the International Traffic in Arms Regulations). 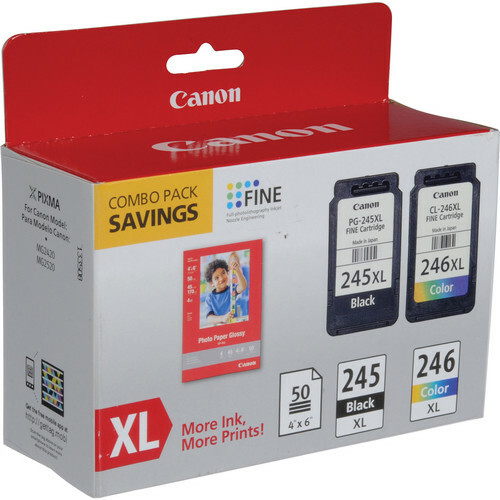 Box Dimensions (LxWxH) 6.7 x 5.75 x 2.55"
PG-245XL / CL-246XL Ink Cartridge Combo Pack with GP-502 Photo Paper is rated 5.0 out of 5 by 13. Rated 5 out of 5 by Old Guy from Best Price!! The cartridges for my printer are hard to find but B&H had them and also there was 20 4X6 photo sheets in the package that were free. Great buy and available. Rated 5 out of 5 by Chris H. from It's ink. It's ink. Goes in the printer, and it prints. As with ALL inks, more expensive than it should be. Rated 5 out of 5 by Amy from Perfect Haven't actually used yet but the same ink I always buy. Works just perfect. Rated 5 out of 5 by Lou from It's ink! This is the name brand ink for their own printer. It works as advertised. Rated 5 out of 5 by djc from Toner came in a timely manner and well packaged. Thank you. Have not used product yet, but came in a timely manner and well packaged. Rated 5 out of 5 by Yulianna from Good ink The ink was delivered promptly and works. 5 stars. are the canon pixma 245 cartridge and the canon pixma 245 XL cartridge interchangeable?